The Lady Victoria Phoenix necklace features three dainty far-eastern phoenix feathers for an exotic look. With it's unique styling, and sparkling crystals making up both the chain and the tips of the feathers the Lady Victoria Phoenix necklace is certainly an attention grabber! The linkages are made of crystal AB beads. A perfect companion to the Duchess Soraya phoenix Swarovski earrings. 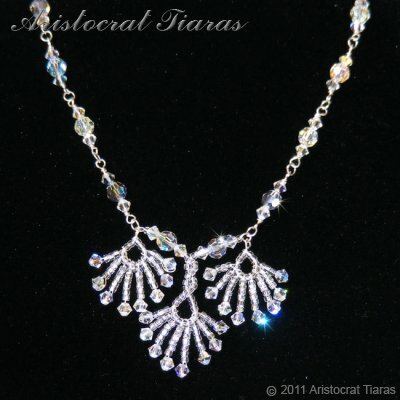 This handmade necklace from Aristocrat Tiaras is part of our bridal jewellery collection for brides designed to compliment our bridal tiaras such as Princess Jasmine phoenix tiara.